Chuck Dutton built Music City Salvage with patience and expertise, stripping historic properties and reselling their bones. Inventory is running low, so he’s thrilled when Augusta Withrow appears in his office offering salvage rights to her entire property. This could be a gold mine, so he assigns his daughter Dahlia to personally oversee the project. The crew finds a handful of surprises right away. Firstly, the place is in unexpectedly good shape. And then there’s the cemetery, about thirty fallen and overgrown graves dating to the early 1900s, Augusta insists that the cemetery is just a fake, a Halloween prank, so the city gives the go-ahead, the bulldozer revs up, and it turns up human remains. Augusta says she doesn’t know whose body it is or how many others might be present and refuses to answer any more questions. Then she stops answering the phone. But Dahlia’s concerns about the corpse and Augusta’s disappearance are overshadowed when she begins to realize that she and her crew are not alone, and they’re not welcome at the Withrow estate. They have no idea how much danger they’re in, but they’re starting to get an idea. On the crew’s third night in the house, a storm shuts down the only road to the property. The power goes out. Cell signals are iffy. There’s nowhere to go and no one Dahlia can call for help, even if anyone would believe that she and her crew are being stalked by a murderous phantom. Something at the Withrow mansion is angry and lost, and this is its last chance to raise hell before the house is gone forever. And it seems to be seeking permanent company. 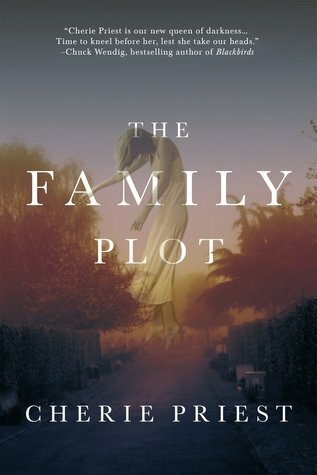 The Family Plot is a haunted house story for the ages-atmospheric, scary, and strange, with a modern gothic sensibility to keep it fresh and interesting-from Cherie Priest, a modern master of supernatural fiction. That about sums it up for me. The Family Plot is more or less a classic ghost story. A woman and her crew sleep in the house they’re working to strip for salvage. The owner of the house seems to only want to be rid of it, and is intentionally cryptic about the house’s history. The house is completely isolated, up a hard-to-get through country road. It seems to be full of treasures, but weird things start happening almost right away. The key problem for me is that the surprises and secrets weren’t terribly surprising. The ghostly presence and its history seem pretty typical for this kind of story. Even when the drama comes to a peak toward the end of the book (cue the stormy night, blocked roads, and lack of emergency vehicles), I did not for a single second feel frightened or chilled or spooked out. The story is fine, but I can’t say much more positive than that. If you’ve ever read a haunted house book before, then you’ll see pretty much the entire plot coming. It’s not boring, but at the same time, it just didn’t move me in the slightest.